Each bit of recognition my work receives always seems a little surreal—could they really be talking about me? about something I wrote?—but I have to admit, this photo seems to approach even higher levels of unbelievability. While bringing home the teapot is surely a great pleasure, the weekend had several other great highlights—both on the official program (from Malice-Go-Round to Dame Agatha’s Tea) and off. 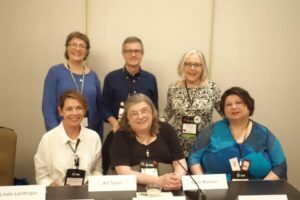 Chief among the official events: The conversation on our short story panel with fellow Agatha finalists Gretchen Archer, Barb Goffman, Edith Maxwell, and B.K. Stevens. 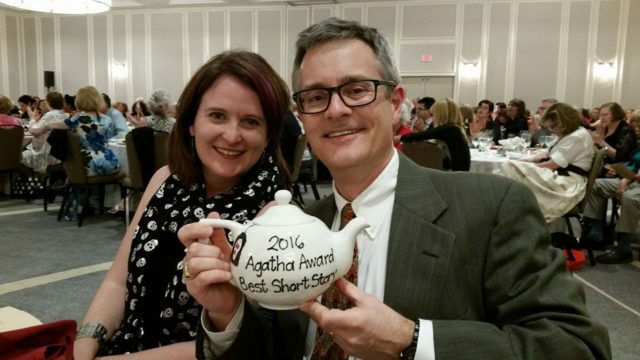 Linda Landrigan, editor of Alfred Hitchcock’s Mystery Magazine, offered some terrific questions on crafting short stories—tone, length, structure, and more. I found myself taking notes on points that the other panelists made, and several people stopped me later to say they found the talk insightful as well. Such a great group of writers, with such a diverse array of stories, and I was proud to be counted among them, grateful to learn from them. I was also honored to have a seat at the long table of contributors to the anthology Malice Domestic 12: Mystery Most Historical—which was part of my post at SleuthSayers on the opening day of the convention. Great to have the final printed copy in hand—and signed! As for unofficial aspects of the weekend…. Each time a reader or fellow writer reached out to say they’d read and admired “Parallel Play,” well, that just meant the world, of course, and it’s those moments that make up so much of the magic of Malice—the reminder that there’s someone on the other side of the page who finds some value in what we do. 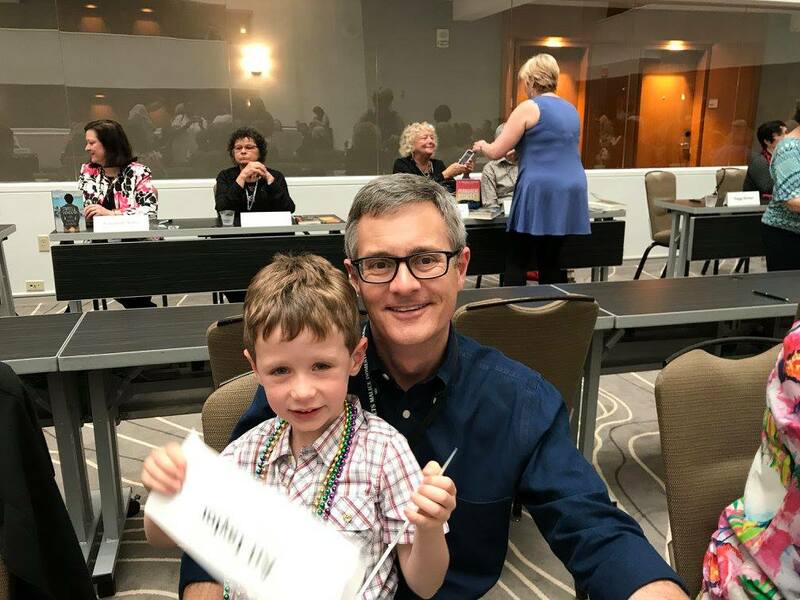 Dash had a tremendous time—on perfect behavior during our short story panel and then making the rounds of the signing room, meeting other authors, collecting bookmarks, and making tons of friends. I couldn’t have been prouder when folks stopped me later to talk about how much they enjoyed meeting him. I’ve said it before, and I’ll say it again, Malice feels like family, and the highlight always is getting together with old friends and making new ones. There were so many people I only see once or twice a year—too many to list everyone—but I cherished the opportunities to see you all this weekend. Thanks particularly to Dana Cameron, Charlaine Harris, Toni Kelner, and Paula Woldan for great conversation at lunch Friday (and for their patience with crazy scheduling issues), and to Janet Hutchings for hosting lunch on Saturday with Ann Cleeves, G.M. Malliet, Martin and Helena Edwards, and Josh and Laurie Pachter (and for their patience with crazy scheduling issues too and with a little boy who was ready to go). Thanks too to all the folks who joined Friday night’s dinner, which was crazy only in how it kept growing and growing and growing: Micki Browning (my Malice Mentor Match-up! ), Bruce Robert Coffin, Karen Cantwell, Matt Iden, Cynthia Kuhn, Liz Mugavero, Nadine Nettman, Alan Orloff, Tony Perona, Lori Rader-Day—oh, I feel like I’m forgetting someone!—and then my co-host for the evening, LynDee Walker. And then thanks to the folks who joined us at Saturday’s banquet table: Paula Benson, Leone Ciporin, Carla Coupe, Christina Hogrebe, Janet Hutchings, Liz Milliron, Alan Orloff, and Valerie Patterson. Hope y’all had even half as much fun as I did! Special thanks to three of those folks above who are always quick to show friendship and support at the times it’s needed most: Carla Coupe, Alan Orloff, and LynDee Walker. It means more than you know. And finally, thanks to everyone at Malice. I mentioned Shawn earlier, but I’m in awe of everyone who makes the weekend work: Verena Rose, Tonya Spratt-Williams, Janet Powell, Anne Murphy, Caroline Craig, Harriette Sackler, Janet Blizard, Angel Trapp, Joni Langevoort, Marian Lesko, and Rita Owen. My hat’s off to you all for a wonderful weekend . Much more I could still say about Malice, of course—but for now just these great memories and great thanks, always, and already looking forward to next year!